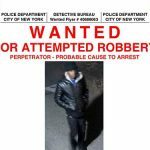 Four Israeli tourists visiting New York for the month of the high holidays were the victims of a robbery at gunpoint while sitting inside the Hamilton Metz (Lefferts) Park on Lefferts Avenue and Albany Avenue in Crown Heights. The victims, two boys and two girls all of whom are 18-years-old, were sitting together a table near the bathrooms when at around 2:00am on Saturday night two black males wearing black hoodies approached them from behind and displayed a black firearm. The perpetrators took the victims Samsung Galaxy cellphones, a portable speaker and $600 in cash from one of the victims pockets. They then fled the park through the soccer field. The victims did not speak English and a translator was required in order to help them file a police report. Thankfully there were no reported injuries to any of the victims. Police sources said that there were two additional reported robberies that same night. The victims in both those cases were black males and one perpetrator was arrested. Police believe that there is a strong chance that he was one of the two involved in the earlier robbery of the four Jewish victims. Must be fake news, de blasio said crime is falling and our “leaders” NEVER challenge that. The park is closed at dusk not sure why anyone is in the park after hours. True, they should not have been in the park. (And many would say they shouldn’t be handing out with girls). But why blame the victim?! The article clearly states that they are foreigners, perhaps they did not know the park rules? I don’t think anyone is blaming the guests. But it is noteworthy to mention that the park does close at dusk. This story should be a lesson for visitors and locals to realize the dangers of hanging out at parks after dark. Baruch Hashem all that happened was that they were robbed of physical items and they were not harmed in anyway. Many of our youngsters today are all too naive of the potential dangers. Please, please be careful and warn your children, relatives, guests and friends about the dangers of being in any secluded area after dark. Especially now during this special month of Tishrei when there are so many exciting late night opportunities to do so. 2 boys 2 girls hanging out together late at night? is that why boys and girls come for tishrie..the hanhola should not let bocherim and girls come there is no reason for them to come!!!!!!!!!! What tishray guest are hanging with girls at close dark park 2:00 am ? Too many come for free food and lodging, great shopping, lax or no supervision and ok, some davening. What exactly are their parents thinking when they allow these Tishrei trips? And now these kids will be traumatized! B”H most Tishrei orchim are sitting and learning under supervision. There will always be the handful of exceptions to the rule who came for the side attractions. It is up to the parents to know who they send here, and make sure that they are davening, learning, farbrenging and going on mivtzoim. Any other extra-curricular “activities” are giving the vast majority of orchim a bad name. There was really no reason to mrntion that there were girls present. Please make a Hachlata in these auspicious days not to publish any Loshen Harah. In general, too much money is being sent out of Crown Heights to help others…Hashem should bless that we should all have more than enough to do so…but until then, Tzedaka starts at home, we need to make sure our families and mosdos are taken care of. Let’s make Crown Heights great again! I heard that a local man was able to rescue the kids, by swinging a chicken in the gunman’s face. It’s terrible that so many people are making all kinds of assumptions about the crime victims-“hanging out,shouldn’t be here,etc.”and right before Yom Kippur! doesnt that park have surveillance cameras?? ?that would be rediculous not to have. I’m sure the perps will be charged with a hate crime.